The Synoptic writers deliberately make this “strange sight” the high point of the ministry of Jesus [Mark 9:2-10; Matthew 17:1-9; Luke 9:28-36]. The astonishment felt and the questions roused by the preceding theophanies “Who can this be?” “Who do you say I am?” — lead to this summit, and it is from here that the journey to the final Passover in Jerusalem begins. 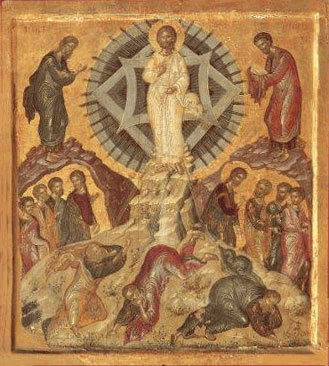 The miracles were anticipations of the energies of the risen Christ; the transfiguration is the theophany that reveals their meaning or, better, that already brings to pass what these energies will accomplish in our mortal flesh: our divinization. The transfiguration is the historical and literary center of the Gospel by reason of its mysterious realism: the humanity of Jesus is the vital place where men become God. Christ is truly a man! But to be a man does not mean “being in a body”, as all the unrepentant dualisms imagine; according to biblical revelation, it means “being a body”, an organic and coherent whole. Because men are their bodies, they are also, like their God, related to other persons, the cosmos, time, and Him who is communion in its fullest possible form. Moreover, ever since the Word took flesh He has a “human” relationship, with all its dimensions, to the Father and to all other men: the fire of His light sets the entire bush aflame; the whole of His humanity is “anointed” with it; “in Him, in bodily form, lives divinity in all its fullness” (Colossians 2:9), and to this Paul adds, “and in Him you too find your own fulfillment” (Colossians 2:10). What was it, then, that took place in this unexpected event? Why did the Incomprehensible One allow His “elusive beauty” to be glimpsed for a moment in the body of the Word? Two certainties can serve us as guides. First, the change, or, to transliterate the Greek word, the “metamorphosis”, was not a change in Jesus. The Gospel text and the unanimous interpretation of the Fathers are clear: Christ “was transfigured, not by acquiring what He was not but by manifesting to His disciples what He in fact was; He opened their eyes and gave these blind men sight.” [Saint John Damascene, "Second Homily on the Transfiguration" (PG 96:564C)] The change is on the side of the disciples. The second certainty confirms this point: the purpose of the transfiguration, like everything else in the economy that is revealed in the Bible, is the salvation of man. As in the burning bush, so here the Word “allows” the light of His divinity “to be seen” in His body, in order to communicate not knowledge but life and salvation; He reveals Himself by giving Himself, and He gives Himself in order to transform us into Himself. But if it be permissible to take off the sandals of curiosity and inquisitive gnosis and draw near to the mystery, we may ask: Why did Jesus choose this particular moment, these two witnesses, and these three apostles? What was He, the Son — so passionately in love with the Father and so passionately concerned for us — experiencing in His heart? A few days before Peter had already been given an interior enlightenment and had acknowledged Jesus as the Christ of God. Jesus had then begun to lift the veil from the not far distant ending of His life: He had to suffer, be put to death, and be raised from the dead. It is between this first prediction and the second that He undertakes to ascend the mountain. The reason for the transfiguration can be glimpsed, therefore, in what the evangelists do not say: having finished the instruction preparatory to His own Passion, Jesus is determined to advance to its accomplishment. With the whole of His being, the whole of His “body”, He is committed to the loving will of the Father; He accepts that will without reservation. From now on, everything, up to and including the final struggle at which the same three disciples will be invited to be present, will be an expression of His unconditional “Yes” to the Father’s love. We must certainly enter into this mystery of committed love if we are to understand that the transfiguration is not an impossible unveiling of the light of the Word to the eyes of the apostles, but rather a moment of intensity in which the entire being of Jesus is utterly united with the compassion of the Father. During these decisive days of His life He becomes transparent to the light of the love of the One who gives Himself to men for their salvation. If, then, Jesus is transfigured, the reason is that the Father causes His own joy to flame out in Him. The radiance of the light in the suffering body of Jesus is, as it were, the thrill experienced by the Father in response to the total self-giving of His only Son. This explains the voice that pierces through the cloud: “This is my Son, the Beloved; He enjoys my favor. Listen to Him” (Matthew 17:5). We can also understand the profound feelings of Moses and Elijah, for these two men who had sensed the closeness of the divine glory that was impatient to save man are now contemplating it in the body of the Son of Man. “I have indeed seen the misery of my people…. I have heard them crying for help…. I am well aware of their sufferings, and I have come down to rescue them” (Exodus 3:7-8); “Answer me, Yahweh, answer me…. I am full of jealous zeal for Yahweh Sabaoth, because the Israelites have abandoned your covenant” (1 Kings 18:37; 19:10). All this is expressed now not by divine words or human words but by the Word Himself in His humanity. No longer is there only promise and expectation, for the event has occurred; there is now present “the reality … the body of Christ” (Colossians 2:17). Moses and Elijah can leave the cave on Sinai without hiding their faces, for they have contemplated the Source of light in the body of the Word. The three disciples, for their part, are flooded for a few moments by that which it will be granted to them to receive, understand, and experience from Pentecost on, namely, the divinizing light that emanates from the body of Christ, the multiform energies of the Spirit who gives life. The thing that overwhelms them here is that “this man” is not only “God with men” but God-man; nothing can pass from God to man or from man to God except through His body. Peter will bear witness in his Letters, as John does in all his writings, to the second of the two certainties I mentioned earlier: that participation in the life of the Father that pours out from the body of Christ is measured by the faith of the human recipient. The new element in the transfiguration consists in this light of faith that has given their bodily eyes the power to see. Thanks to this light, they “touch the Word of life” when they draw near to the body of Jesus. Henceforth there is no longer any distance between matter and divinity, for in the body of Christ our flesh is in communion (without confusion or separation) with the Prince of life. The transfiguration of the Word gives a glimpse of the fullness of what the Word inaugurated in His Incarnation and manifested after His baptism by His miracles: namely, the truth that the body of the Lord Jesus is the sacrament that gives the life of God to men. When our humanity consents without reserve to be united to the humanity of Jesus, it will share the divine nature (2 Peter 1:4); it will be divinized. Since the whole meaning of the economy of salvation is concentrated here, it is understandable that the liturgy should be the fulfillment of the economy. The divinization of men will come through sharing in the body of Christ.